Review by AllTheBestFights.com: 2019-04-06, fight not so exciting between Ali Bagautinov and Vartan Asatryan: it gets two stars. The former World Combat Sambo champion Ali Bagautinov entered this fight with a pro mma record of 18-6-0 (56% finishing rate) and he is ranked as the No.11 flyweight in the world. He lost two consecutive bouts between 2016 and 2017, against Kyoji Horiguchi (Horiguchi vs Bagautinov) and Tyson Nam (Ali Bagautinov vs Tyson Nam), but then he has won four bouts defeating Denis Oliveira Fontes Araujo in his last one. His opponent, Vartan Asatryan, has a record of 21-8-0 (71% finishing rate) and he entered as the No.69 in the same weight class. He lost to Tagir Ulanbekov in 2017 but he came back to win against Rizvan Abuev in 2018. 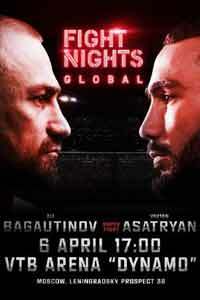 Bagautinov vs Asatryan is the main event of Fight Nights Global 92. Watch the video and rate this fight! Review by AllTheBestFights.com: 2018-08-31, fight not so exciting between Zhalgas Zhumagulov and Tagir Ulanbekov: it gets two stars. Zhalgas Zhumagulov entered this fight with a professional mma record of 11-3-0 (64% finishing rate) and he is ranked as the No.23 flyweight in the world. He lost to Vartan Asatryan last year but then he has won over Shaj Haque and Tyson Nam (Tyson Nam vs Zhalgas Zhumagulov). His opponent, the undefeated Tagir Ulanbekov, has a perfect record of 6-0-0 (67% finishing rate) and he entered as the No.32 in the same weight class. He fought three times last year beating Assu Almabaev, Shaj Haque and Vartan Asatryan. Zhumagulov vs Ulanbekov, main event of Fight Nights Global 88, is valid for the FNG flyweight title. Watch the video and rate this fight! Review by AllTheBestFights.com: 2018-05-19, good finish between Nikita Krylov and Fabio Maldonado: it gets three stars. The black belt in karate Nikita Krylov entered this fight with a professional mma record of 23-5-0 (100% finishing rate) and he is ranked as the No.17 light heavyweight in the world. He was defeated by Misha Cirkunov in 2016 but then he beat Stjepan Bekavac (Nikita Krylov vs Stjepan Bekavac), Maro Perak and Emanuel Newton in 2017. His opponent, the current FNG light-Hw champion Fabio Maldonado, has an official record of 24-11-0 (75% finishing rate) and he entered as the No.22 in the same weight class. ‘Caipira de Aco’ Maldonado lost four consecutive bouts between 2015 and 2016, the last two with Fedor Emelianenko (Fedor Emelianenko vs Fabio Maldonado) and Mikhail Mokhnatkin, but then he has won over Abdul-Khamid Davlyatov and Kurban Omarov. Krylov vs Maldonado is valid for the FNG light heavyweight title (Maldonado’s first defense); undercard of David Khachatryan vs Peter Queally – Fight Nights Global 87. Watch the video and rate this fight! Review by AllTheBestFights.com: 2018-04-01, some good exchanges between Tyson Nam and Zhalgas Zhumagulov but it is not enough to get three stars: it gets two. Tyson Nam entered this fight with a professional mma record of 16-8-1 (62% finishing rate) and he is ranked as the No.14 flyweight in the world. He lost four consecutive fights between 2013 and 2014 but then he has collected four victories and one draw beating Ali Bagautinov (Ali Bagautinov vs Tyson Nam) and Rizvan Abuev in 2017. His opponent, Zhalgas Zhumagulov, has an official record of 10-3-0 (70% finishing rate) and he entered as the No.75 in the same weight class. He fought three times last year defeating Artur Bagautinov and Shaj Haque but between these two bouts he lost to Vartan Asatryan. Nam vs Zhumagulov is the main event of Fight Nights Global 86. Watch the video and rate this fight! Review by AllTheBestFights.com: 2018-02-22, spectacular finish between Akhmed Aliev and Magomedsaygid Alibekov: this is one of the best mma fights of 2018 and it gets four stars! Akhmed Aliev entered this fight with a professional mma record of 16-4-0 (56% ko/tko victory rate – he has never won via submission) and he is ranked as the No.22 lightweight in the world. He lost to Vener Galiev in 2015 but since then he has won seven consecutive bouts beating Efrain Escudero and Diego Brandao in 2017. His opponent, the undefeated Magomedsaygid Alibekov, has a perfect record of 9-0-0 (33% finishing rate) and in his last three fights he has won over Matej Truhan, Nariman Abbasov and Kuat Khamitov. Aliev vs Alibekov, main event of Fight Nights Global 83, is valid for the FNG lightweight title. Watch the video and rate this fight! Review by AllTheBestFights.com: 2017-12-16, pretty good finish between Vitaly Minakov and Tony Johnson but it is not enough to get three stars: it gets two. The undefeated black belt in judo, former Bellator and world combat sambo champion Vitaly Minakov entered this fight with a perfect mma record of 20-0-0 (90% finishing rate) and he is ranked as the No.18 heavyweight in the world. He has fought twice in 2017 beating DJ Linderman (=Minakov vs Linderman) and Antonio Bigfoot Silva (=Minakov vs Silva). His opponent, Tony Johnson, has a record of 11-3-0 (55% ko/tko victory rate – he has never won via submission) and he entered as the No.26 in the same weight class. He lost to Cheick Kongo last year (=Kongo vs Johnson) but he came back to win in 2017 with Magomedbag Agaev. Minakov vs Johnson is the main event of Fight Nights Global 82 – FNG 82. Watch the video and rate this fight! Review by AllTheBestFights.com: 2017-06-02, good finish between Nikita Krylov and Stjepan Bekavac: it gets three stars. The black belt in karate Nikita Krylov entered this fight with a mma record of 21-5-0 (100% finishing rate) and he is ranked as the No.19 light heavyweight in the world. He fought three times in 2016 beating Francimar Barroso (=Barroso vs Krylov) and Ed Herman (=Krylov vs Herman) but then he was defeated by Misha Cirkunov. His opponent, Stjepan Bekavac, has a record of 19-6-0 (89% finishing rate) and he entered as the No.71 in the same weight class. He lost to Maxim Futin last year but then he has beat Martin Solc and Evan Nedd. Nikita Krylov vs Stjepan Bekavac is on the undercard of Sergey Pavlovich vs Mikhail Mokhnatkin – FNG 68. Watch the video and rate this fight! Review by AllTheBestFights.com: 2017-06-02, pretty good finish between Vitaly Minakov and Antonio Silva but it is not enough to get three stars: it gets two. The undefeated black belt in judo, former Bellator and world combat sambo champion Vitaly Minakov entered this fight with a perfect mma record of 19-0-0 (89% finishing rate) and he is ranked as the No.19 heavyweight in the world. He fought just once last year beating Peter Graham (=Minakov vs Graham) and then he has defeated DJ Linderman in 2017 (=Minakov vs Linderman). His opponent, the black belt in judo, karate and Brazilian jiu-jitsu Antonio ‘Bigfoot’ Silva, has a record of 19-11-1 (89% finishing rate) and he entered as the No.35 in the same weight class but he won just one out of his last nine bouts, against Soa Palelei in 2015 (=Silva vs Palelei). After this fight he lost four fights, the last one with Ivan Shtyrkov (=Bigfoot vs Shtyrkov). Vitaly Minakov vs Antonio Bigfoot Silva is on the undercard of Sergey Pavlovich vs Mikhail Mokhnatkin – FNG 68. Watch the video and rate this fight! Review by AllTheBestFights.com: 2017-06-02, boring fight between Sergey Pavlovich and Mikhail Mokhnatkin: it gets one star! The undefeated Sergey Pavlovich entered this fight with a perfect record of 10-0-0 (80% ko/tko victory rate – he has never won via submission) and he is ranked as the No.33 heavyweight in the world. He fought four times last year winning over Magomedbag Agaev, Chaban Ka, Akhmedshaikh Gelegaev and Alexei Kudin. His opponent, Mikhail Mokhnatkin, has an official record of 9-1-2 (78% finishing rate) and he entered as the No.55 in the same weight class. He suffered his only loss when he faced Murad Chachanov at his pro mma debut in 2010; he fought twice in 2016 drawing with Alexei Kudin and beating Fabio Maldonado. Sergey Pavlovich vs Mikhail Mokhnatkin is the main event of Fight Nights 68 – FNG 68. Watch the video and rate this fight! Review by AllTheBestFights.com: 2017-04-28, Ali Bagautinov vs Tyson Nam gets three stars thanks to a good finish. The former World Combat Sambo champion Ali Bagautinov entered this fight with a professional mma record of 14-5-0 (64% finishing rate) and he is ranked as the No.17 flyweight in the world but he won just one out of his last four fights, against Geane Herrera; after this bout he lost to Kyoji Horiguchi (=Horiguchi vs Bagautinov). His opponent, Tyson Nam, has an official record of 14-8-1 (57% finishing rate) and he entered as the No.39 in the same weight class. He lost four consecutive fights between 2013 and 2014 but then he has won twice in 2015 and drew with Yoni Sherbatov in 2016. Tyson Nam vs Ali Bagautinov is the main event of Fight Nights Global 64. Watch the video and rate this fight!